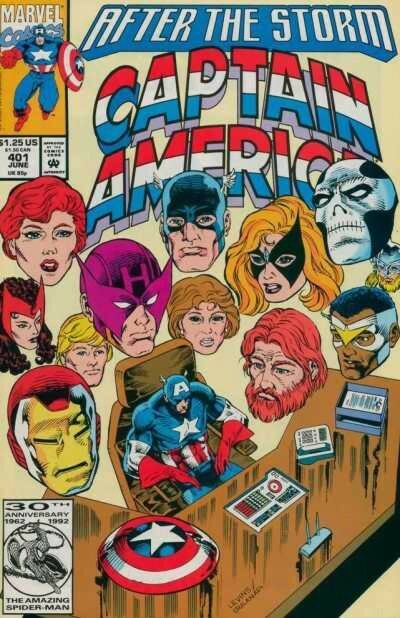 Operation: Galactic Storm begins in Captain America #398 (March 1992) with the kidnapping of Rick Jones by Shi’ar agents intent on recovering Kree artifacts to aid them in the construction of a super weapon. In the course of rescuing Jones, Captain America discovers that a conflict has begun between the alien Kree and Shi’ar empires. In Quasar #32 (March 1992) Captain America’s fellow Avenger Quasar discovers that the use of a nearby stargate by the warring factions is destabilizing Earth’s sun. The Avengers gather and resolve to intervene in the conflict to try to ensure the safety of their solar system either by bringing about a truce or by diverting the two empires from using the nearby stargate. 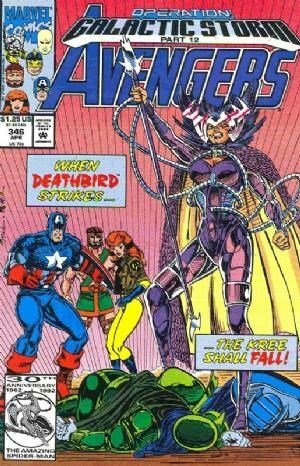 In Avengers #345 (March 1992) a gathering of over twenty Avengers are divided into three teams to deal with the threat. One of the teams stays on the Earth to protect the planet for the duration of the conflict, while the other two are sent to the Shi’ar and Kree homeworlds via the Stargate to try to negotiate with the two empire’s leaders. The “Earth team” is led by the Wasp and includes the Falcon, Henry Pym, Gilgamesh, Mockingbird, She-Hulk, Spider-Woman, and U.S. Agent. 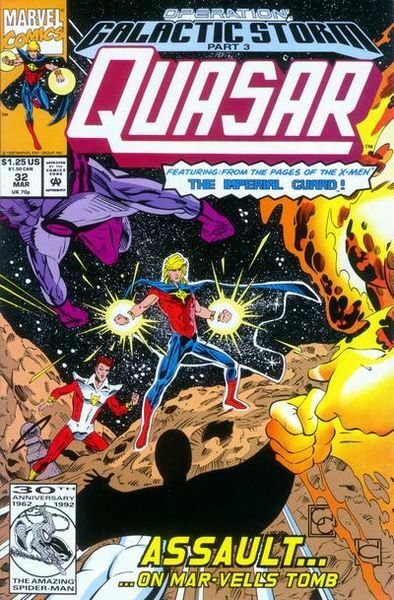 Quasar and Her also remain in the Solar System to guard the stargates. The “Shi’ar Team” is led by Captain Marvel and includes the Living Lightning, the Scarlet Witch, Starfox, Thor, Vision, and Wonder Man. Finally, the “Kree Team” is led by Captain America and includes the Black Knight, Crystal, Goliath, Hercules, Iron Man, and Sersi. In the story, U.S. Agent is originally assigned to the “Kree Team” and Hawkeye to the “Earth Team”, but Hawkeye perceives this as a slight and is given some Pym Particles by Hank Pym so that he might increase his superhuman abilities (and thus qualify for inclusion on the “Kree Team”) by re-assuming his Goliath identity. 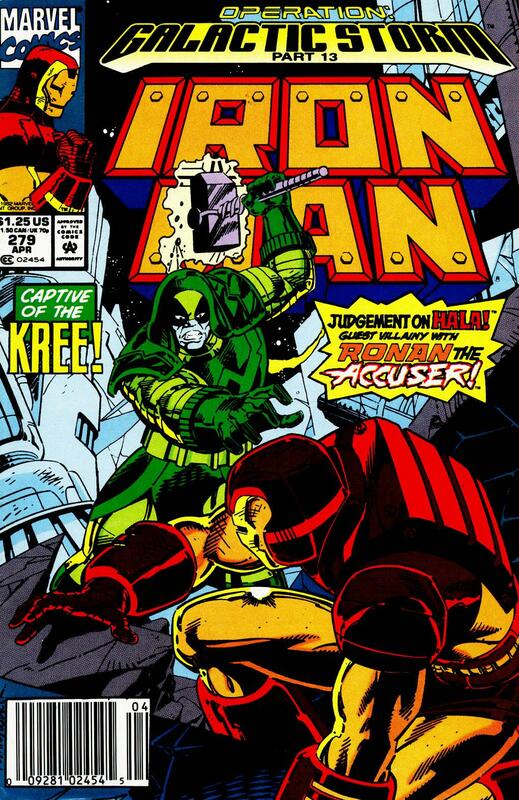 This is one of the story’s few overt references to the original “Kree-Skrull War” storyline, as Barton appears as Goliath in that storyline as well (something which Barton and Pym comment on in the story). 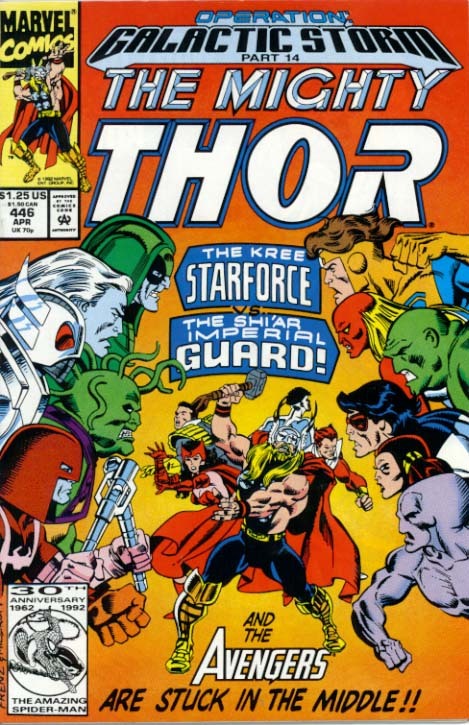 The Kree and Shi’ar Avengers teams go on to encounter the various factions (including their own super-powered teams, Starforce and the Imperial Guard, respectively) and are largely unsuccessful in engaging them in negotiations. Captain America’s team are repeatedly captured and imprisoned by the Kree authorities while Captain Marvel’s team engages in a number of short battles with various Shi’ar forces. 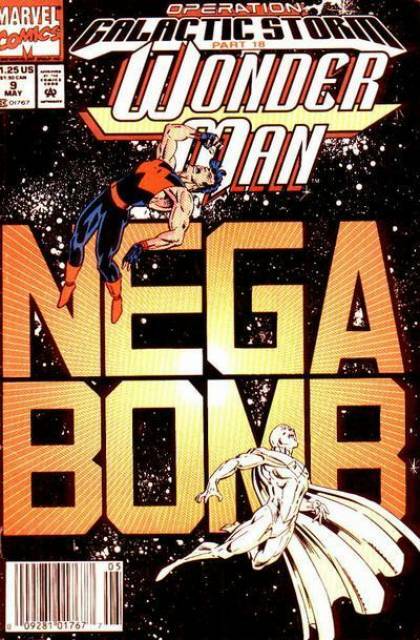 During the course of these encounters it is revealed that the Sh’iar has managed to create a massive super weapon—the “Nega-Bomb”—using Kree artifacts including the original Captain Marvel’s Nega-Bands which has been stolen from the dead hero’s tomb. This bomb is capable of devastating an area equivalent to that of the Kree Empire (which is supposedly located throughout the Large Magellanic Cloud). 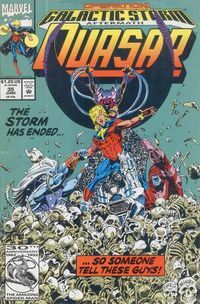 Also during the conflict, the Kree’s military leaders are assassinated by the Shi’ar agent Deathbird, the Supreme Intelligence regains (temporary) control of the Kree forces, and Skrull agents are revealed to be surreptitiously manipulating the court of the Shi’ar Majestrix Lilandra into escalating the conflict. Eventually, Captain Marvel’s Avengers delegation manages to convince Lilandra to try to begin peace negotiations with the Kree. However, by this point, the Nega-Bomb has been stolen by Skrull agents and her efforts to recall the weapon fail. 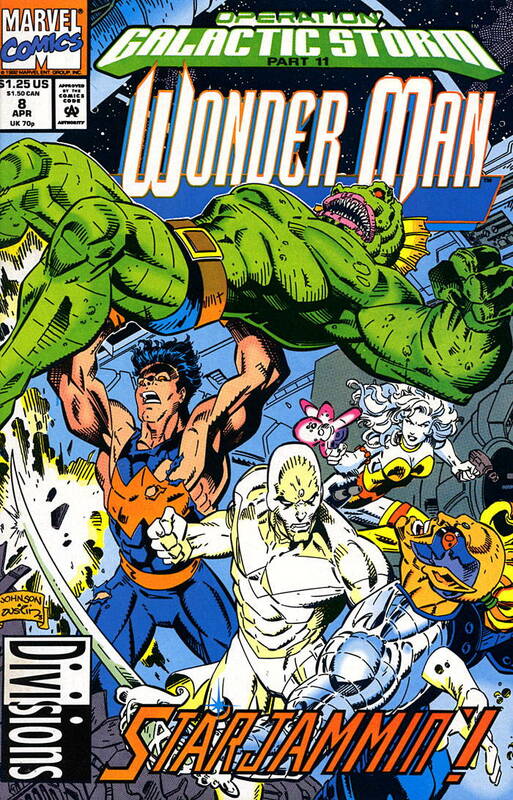 Despite the presence of Avengers members Wonder Man and the Vision in the Nega-Bomb’s massive interior, the device is successfully detonated in Wonder Man #9 (May 1992). The Kree Empire is devastated by its effects, with billions dying instantaneously. 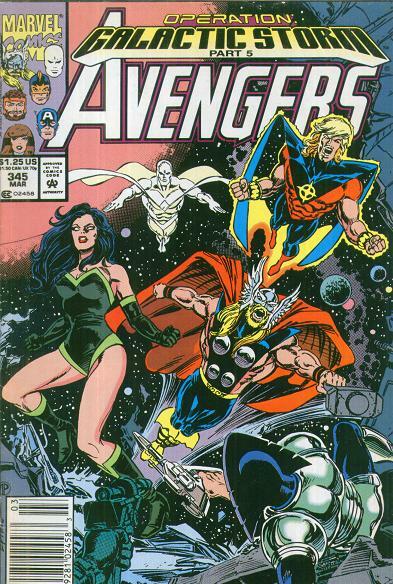 In Avengers #347 (May 1992) the various Avengers (all of whom manage to survive the bomb’s effects; the Vision turned intangible, Wonder Man’s ionic body absorbed the released energy, Sersi turned the rest of the Kree team into inanimate matter, and the Shi’ar team hadn’t arrived on the scene yet) gather on Hala, the Kree homeworld, and discover that most of the events of the war- up to and including the Nega-Bomb’s detonation- have been manipulated and engineered by the Kree Supreme Intelligence. This creature, an amalgam of the consciousness of thousands of generations of Kree military leaders, calculated that the bomb’s radioactive effects would serve to jumpstart the Kree race’s evolution which had previously been thought stalled. Horrified by this revelation, and faced with the problem with what to do now with the captured Supreme Intelligence, a group of Avengers decides that the Supreme Intelligence should be killed for its act of genocide. Disagreeing with this idea completely, Captain America holds a vote, and when a majority of Avengers agree that killing the Intelligence is not appropriate, he orders that no Avenger should kill the creature. 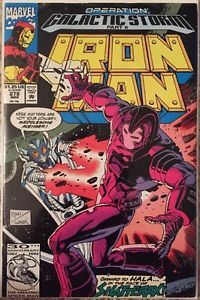 Iron Man refuses to follow this order (invoking his seniority as a founding member), and he and the other dissenting Avengers- Black Knight, Hercules, Sersi, Thor, Vision, and Wonder Man attempt to terminate the creature, apparently succeeding. A Shi’ar delegation then appears and announces that they will annex the devastated Kree Empire, with Lilandra’s sister Deathbird becoming viceroy of the Kree territories. 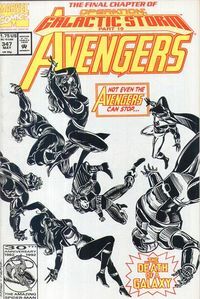 The Avengers return to Earth divided and disillusioned by the events of the storyline, and the consciousness of the Supreme Intelligence is shown to have survived and escaped to a waiting spaceship manned by Skrulls. 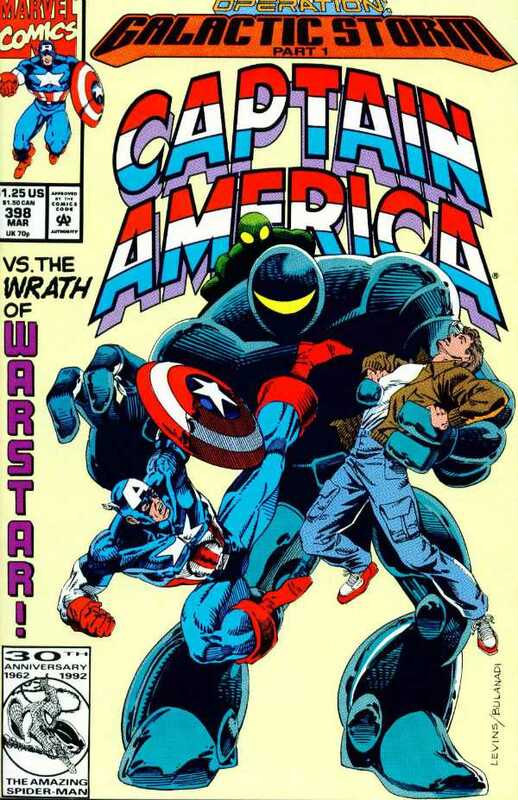 The immediate aftermath of the storyline is explored in the Captain America and Quasar titles. 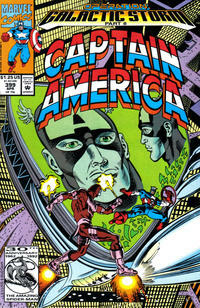 Captain America #401 (June 1992) examines the effects of the conflict on Captain America, such as his disappointment in those teammates who disobeyed his orders and in the Avengers group as a whole. 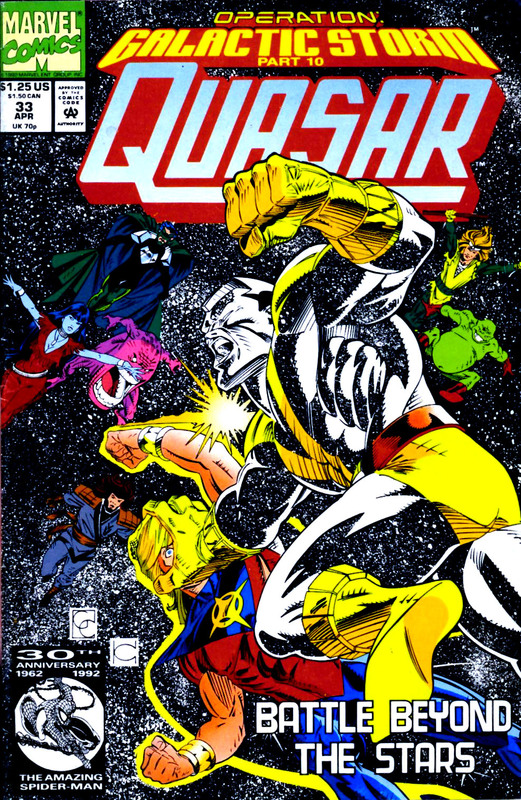 Quasar #35 and #36 (June – July 1992) explores the larger repercussions of the storyline: the effect on the wider cosmos of the Nega-Bomb explosion and the sudden death of billions of lifeforms and the collapse of a major space empire.